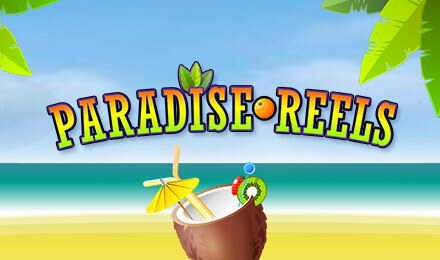 Relax with a tropical drink in hand as you play Paradise Reels slots! With tons of bonus features and fun fruity icons you'll be hitting big winnings and enjoying paradise! This beachy slots game offers 5 reels and 8 paylines for simple relaxed holiday fun! The classic reel symbols are charming juicy fruites, and the bonus you can activate will have you digging your toes into the sand. With fruity icons, Bonus Features, and Wild symbols, you'll be spinning to win big throughout your entire vacation!